Bernard and son Joe enjoying a late afternoon pedal on the lake. Photo supplied. 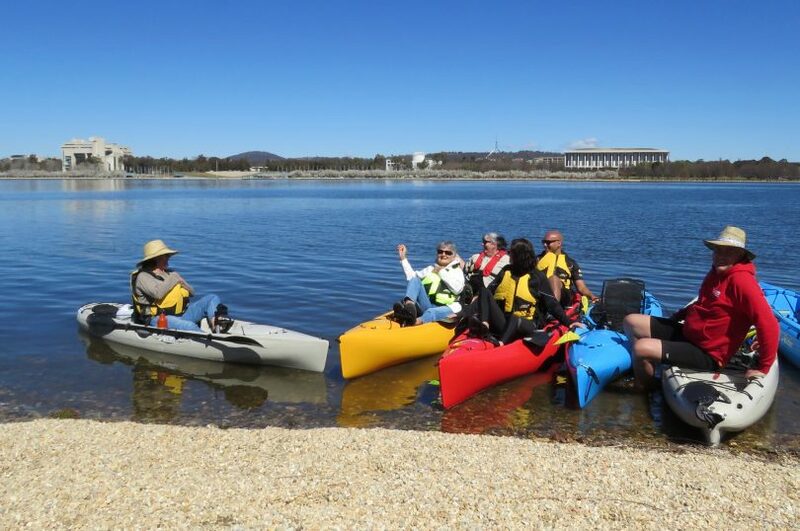 A conservationist with a love for Canberra’s waterways has brought guided kayak tours to Lake Burley Griffin for the first time – offering people the chance to enjoy the serenity and beauty of our lake in a new way. In another first for the lake, the kayaks are pedal-driven, meaning they provide a hands-free way to cruise with ease while taking photos, using binoculars, enjoying snacks or the like. 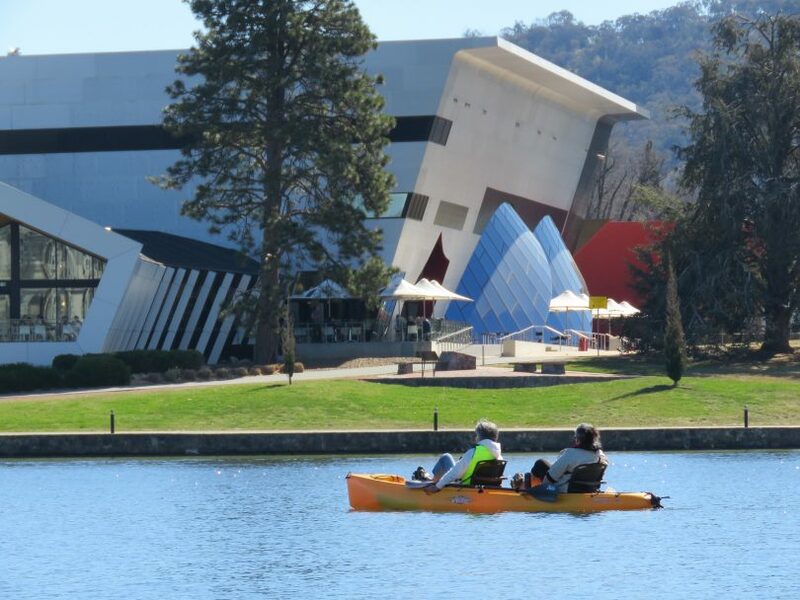 And for the next two weekends, while Floriade is on, Canberrans are being offered the opportunity to have introductory half-hour or one-hour kayak tours leaving from the pebble beach next to the RG Menzies statue – with a special ‘two for one’ introductory offer for RiotACT readers. After Floriade, regular one hour and two hour sunset kayak tours will run during the daylight saving months from the jetty at Lawson Crescent near the National Museum of Australia. Graham Tupper is the man behind the new venture and has traded walking the corridors of Parliament House for the delight of sharing his passion for the outdoors with visitors and locals alike. “I am a conservationist who loves being outdoors and loves providing people with experiences of the outdoors and a bit of adventure,” he said. For the past 12 years, Graham has worked as a conservationist for the Australian Conservation Foundation but a month ago he decided on a career move which still reflected his love for nature. Graham and his wife Deb Melaluca are the owners of the new locally operated Canberra Urban Adventures business which has partnered with Urban Adventures Ltd, part of the Intrepid Travel Group. Graham said that he, Deb and their combined family of five children “have experienced many an adventure on the rivers and lakes with the kayaks, on cycle tours and camping in the Brindabellas”. “This is the natural extension of what I love to do,” he said. Graham said that the guided kayak tours offer people the advantage of being able to learn about the areas they are paddling around in, while also providing safety and security for first-time kayakers. Then there is the beauty of the experience. “One of the things you realise when you are on the water, particularly in a kayak, is how peaceful it is. It is very serene and you can get up really close to the birds if you drift. “It is a different pace of life,” he said. Graham said it took months of trials and gaining permits from the National Capital Authority before he could get underway but he is already enjoying taking people out on the lake. Deb Melaluca and her 84-year-old mum Betty enjoying a view of the National Museum of Australia from the lake. Photo supplied. 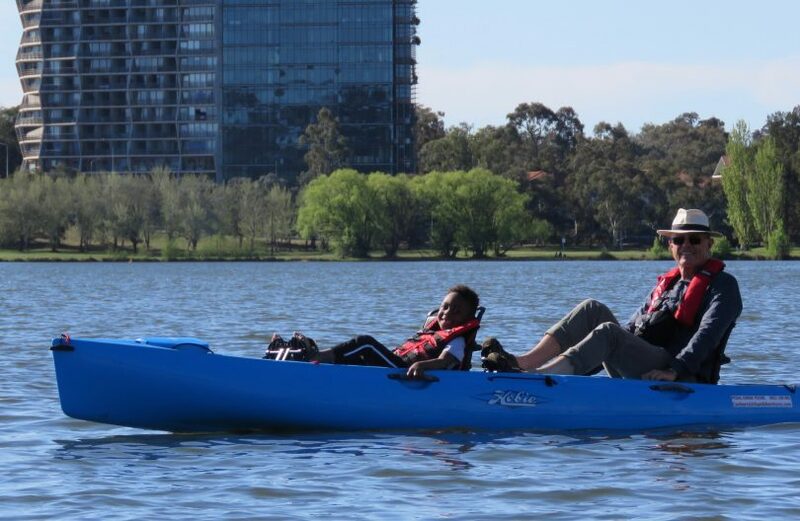 The special Floriade season pedal kayak tours were launched last Sunday and will operate on Saturday and Sunday for the next two weekends (October 7-8 & 14-15) between 10.30 am and 4 pm, leaving just down the hill from Regatta Point. The tours offer a circuit of the central lake including around the Captain Cook water jet, Aspen Island and the National Carillon. The half-hour tour costs $20 and the one-hour tour costs $35 but there is a special introductory offer for RiotACT readers. Just mention The RiotACT and you can enjoy a ‘two for the price of one offer’ for people aged 15 or over travelling in a double kayak. Alternatively, under the offer children aged between 6 and 15 can go on the tours for free if they are travelling with a parent or grandparent in a double kayak (with a maximum of four children per tour). No bookings are required for the Floriade introductory tours but if you have a bigger family group and want to book ahead you can contact Graham on 0421 140 401 or email him at info@canberraurbanadventures.com. Friends visiting from out of town in the pedal kayaks near ‘Bob’s beach’. Photo supplied. Then on October 11, as Floriade draws to a close, the special two-hour sunset tours from 6-8 pm and the regular one-hour tours (4-5 pm) will be launched and will run for the daylight saving months. These tours need to be booked in advance either using the contact details above or by going to www.canberraurbanadventures.com. The one hour tour costs $35 for adults and $20 for children and cruises around the lake, with views of Canberra’s iconic national buildings and parades such as the National Library, High Court, Parliament House and the Australian War Memorial. The two-hour sunset tour costs $86 for adults and includes drinks (sparkling water or juice), fresh fruit and chocolates. On this tour, people cruise the central lake with a stop on Aspen Island and the National Carillon (bell tower) for unique views of Canberra’s grand design and iconic buildings. Graham does not hire out kayaks but is willing to work with groups who would like to create their own accompanied adventure, perhaps for a family occasion or the like. Life vests are provided for all the tours and crocs and raincoats are provided if needed. For further details and itineraries please go to www.canberraurbanadventures.com or contact Graham on 0421 140 401. Have you ever been out on Lake Burley Griffin? Do you think it is good for Canberrans and visitors to have more opportunities to enjoy the lake? Let us know your thoughts in the comments below. Ready to welcome you to some adventure down by the lake Fred. This is our last weekend of the special opening weeks/Floriade season pedal kayak tours. And the 2 for 1 offer, and kids 6-11 yrs free offer, to RiotACT readers. No bookings required. If you can’t make it this weekend you will find us down by the water on Lawson Cres near the National Museum for afternoon or sunset tours during the daylight saving months – but you will need to book ahead for those tours at http://www.canberraurbanadventures.com.